Never leave delicious red and white wines behind again; get yohino Stainless Steel Wine Stakes and enjoy wine at every outdoor event, party or gathering. Do you love wine? Do you consider yourself a bit of a wine connoisseur? If so, then we have the perfect travel and outdoor product for you-yohino Stainless Steel Wine Stakes are made for holding wine glasses and wine bottles up off the ground so you can enjoy delicious red and wine at the beach, lake, park, or in your own backyard. 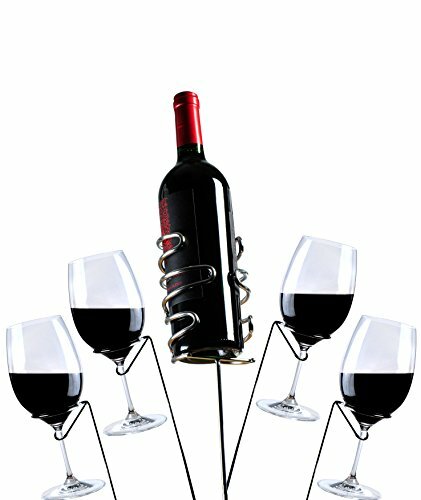 These unique stakes slide firmly into the ground and offer specially designed holders to keep your glasses and bottle upright without you ever needing to hold it in your hand; no table or basket required! Simply stick them in the ground and the rigid, stainless steel design will firmly hold your glassware reducing spills or breaks. Whether you are planning a romantic outdoor getaway with a loved one or want to listen to soothing jazz at the park, get the yohino Wine Glass and Bottle Stake Set and let the tunes pour in while the wine stays within arm's reach. Wine Glass Stake Length: 15"
Click 'Add to Cart' above and get a set of versatile, lightweight wine and bottle stakes that help you enjoy wine more easily at home and on the go! UPGRADED MODEL - Unlike the standard single-looped wine glass stakes in the market, the yohino glass stakes are reinforced with a double loop for better glass stability. Our double brace bottle stake is stronger than the typical single coil design, so your bottle remains secure and will not tip over easily. STYLISH, FUN & TRENDY - Take your favorite wine to the beach with friends, plan a movie night in the park, or relax at an outdoor concert; these wine stakes hold a red or white wine bottle and four glasses for everyone to enjoy! SECURE & STABLE - Made with premium grade stainless steel, each wine glass stake features a carefully designed holder that's safe on glass, while the wine bottle holder gently secures and stabilizes the bottle even if it's completely full. VERSATILE DECORATION - Not only are yohino Wine Stakes perfect for holding delicious Moscatos and Pinots, they can also be used to hold candles to illuminate your backyard. LIGHTWEIGHT & PORTABLE - These wine holders stack together easily so you can use them at home, take them to a friend's house, or enjoy them at the lake. You'll love how easy it is to take wine with you on every adventure. If you have any questions about this product by yohino, contact us by completing and submitting the form below. If you are looking for a specif part number, please include it with your message.